**IF INTERESTED/INQUIRING ABOUT ADOPTING, YOU MUST FILL OUT AN ADOPTION APPLICATION LOCATED AT H3RDFW.ORG/ADOPTION-APPLICATION. HIS ADOPTION FEE IS $250. ** Hi! My name is Andy. 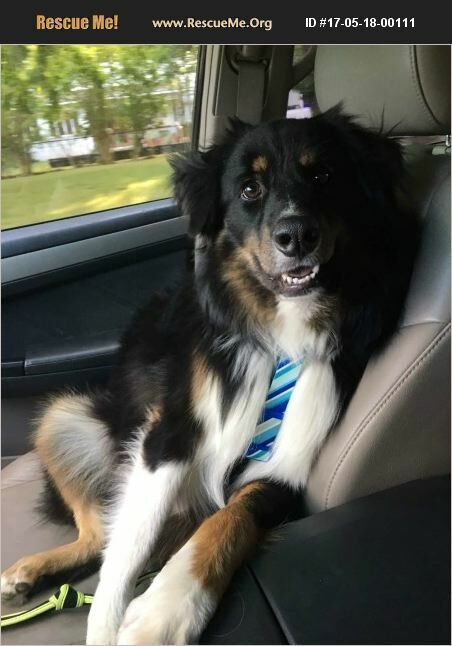 I am a 2 year old Australian Shepherd mix who has a lot of energy and a really engaging personality. I've heard people say that I have a gorgeous coat. Don't know about that, but I love getting brushed. I love to play fetch, and I will even bring the ball back to you... most times. My favorite toy is the jolly ball. I can play with the jolly ball for a long time and it's a party for one! Here are my best qualities: I am: House trained and Crate trained. I love my crate! It's my safe place! I know basic obedience, sit, stay, down, come, heel, leave it, drop it and more I enjoy riding in the car once we get going. I don't bark or growl at passing cars, people, or dogs. I am a perfect gentleman when out in public I love to cuddle and receive affection I am an amazing alert dog. My bark is extremely fierce, so no one will come into my home without an invite. I am a wonderful young dog that has a lot of potential, with the right family. Now that being said, I do have some issues that would require my future forever family to be very experienced with reactive dogs. When a person comes towards me, especially in doorways or closed off spaces, I am 'HYPER-REACTIVE'. This means that I will lunge and bark excessively at those who are approaching me. Sometimes I get so worked up that I have saliva at the corners of my mouth. Basically I go into extreme panic mode of flight or fight. My trainer said that it's almost like I suffer from a form of PTSD when I feel trapped. When I meet dogs or strangers in 'open' areas, I do much better with initial meetings. You may wonder how, you, as my potential adopter should handle these situations. The answer is: Let me be in my crate with a great bone to chew on when people and/or dogs are coming into our home. Make sure I'm on a leash and in your control when going to meet new people or dogs. A ball can divert my attention fast. Thunder coats help me relax and feel secure. As a wrap up, I am Andy and do have issues with confidence and meeting new people and dogs in close spaces, but I'm also a big ball of love and laughter! I don't run, I BOUNCE when I'm happy and excited. I'm fully vetted and ready for my family!